Spotting a scammer email to your classified ad. Just a reminder to watch out for criminal scammers when you place an ad on the classifieds. 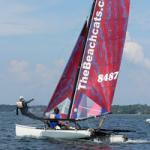 The classifieds are great and very active, tons of catamaran boats and parts get sold there. It's easy to get excited when you've placed an ad and get that great "contact seller" email enquiring about your item. If you don't place a lot of online ads you might not recognize the signs that you are being roped into a scam. The initial email is almost always strangely formal and specific. Here's a real example that was just reported. I am interested in buying your 2010 Weta #357 and would like to receive additional information about it and pictures if available, i would like to pay with PayPal. The way the scammer matches the "your 2010 Weta #357" with the ad title, who does that? Real initial enquiries are more casual. They say they want to Buy and how they want to pay, without asking any questions about the item itself. Real buyers have specific questions about the item even if they really do want to buy it now, and payment isn't the first thing mentioned. If you end up answering a contact email that is a scammer because you weren't quite sure and it might be legit, the next email will tell the tale. They will be more interested in explaining why they can't meet in person or talk on the phone and there will be some fishy stuff about payment. here's the real followup email to the Weta contact. Quote Good to hear back from you, i work with Baker Hughes Process and Pipeline Services (offshore oil and gas platforms) at this moment i am presently working offshore i wont be able to check the boat am buying this for my brother as a surprise gift so am willing to offer you the amount you requested, sometimes access to regular emails and phone calls are very poor in offshore due to inefficiency of phone and internet connections, more so we are often constrain from accessing the internet or making phone calls, i insisted on PayPal because i don't have access to my bank account online and i don't have internet banking too, but i can pay from my PayPal account, you don't need to bother yourself about the shipment because i have a pick-up agent that will come for the pick-up and they will also determine and secure the shipment, get back to me with your PayPal email address so that i can make the payment, i will also need your full name and phone number. Basically complete double-talk BS with nothing about the boat or part they supposedly want to buy. If you continue after this, the next step in the scam is some form of request that you "help them out" by letting them pay you more than you ask to cover "expenses" and you can refund the difference later, they will trust you. Hope that helps someone avoid contact with these a$$holes. It's an unfortunate part of any online advertising. If anyone has something to add to help spot scammers, please share here. I got the same response to a boat for sale ad yesterday, identical second message. I was going to message you to the tactic, but you beat me to it.. Went thru exactly what was explained about but with a car not a boat. It was.... "I'll have movers pick it up and I will send you a certified cheque." I got the cheque took it to my bank and it was fraudulent. I then went to police station and reported it. The police told me to discontinue contact with the buyer and to avoid the temptation of being nasty thru email or texting. I did what they told me to do, and all went well. Now, if I'm selling anything, I can spot the scammer emails in a second. Be cautious, don't forward and personal info and make up something to discontinue conversations in a positive way. I only accept cash and meet buyer in a public neutral place when I can... And trust your instincts! they have been banned but contacted a lot of ads. If you have already emailed this scammer I'd advise having no more contact.